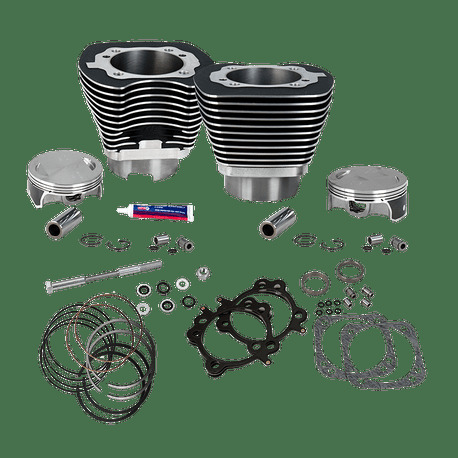 This big bore cylinder and piston kit can be used as replacement for the cylinders and pistons for an S&S 124" Hot Set Up Kit, a T124 T2 engine or as the basis for a new engine build. 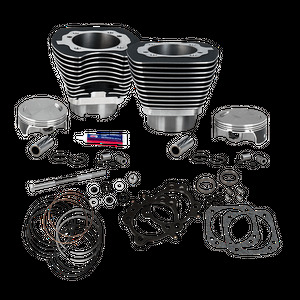 Kit contains S&S 4-1/8" bore cylinders and forged flat dome pistons, rings, wrist pins, head and base gaskets. The cylinders are machined with the stock bolt pattern and are intended for use in stock crankcases of 2007-'16 big twin engines. This kit must be used with 4-5/8" flywheels resulting in 124' displacement. Cylinder finish is a durable wrinkle black powder coat. This cylinder kit may be used with stock or S&S cylinder heads with stock bolt pattern. For best performance, appropriate camshafts, performance air cleaner, performance exhaust and fuel system tuning are required.